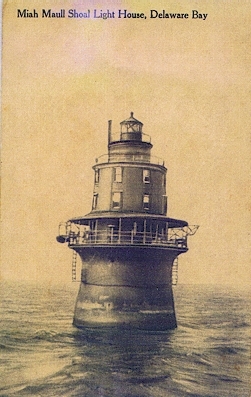 The lighthouse was constructed in 1909, upon the Miah Maull Shoal, which was named for Nehemiah Maull, who was drowned near the site. Located at 39° 07' 35" x 75° 12' 34". 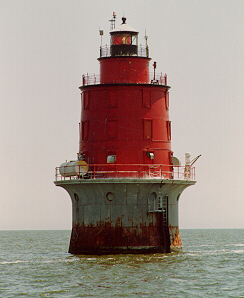 It is an automated light, maintained by the USCG ANT (Aids to Navigation)Team in Cape May. In the 1980's the "skirt" awning that covered the lower walkway was removed. In 1913, the permanent light was turned on for the time and could be seen for 15 miles with its 4th order lens. It was fully automated in 1973. It was painted brown originally.